Jan Mostaert was a 16th-century painter from Haarlem who achieved considerable renown for his religious compositions and portraits, both of which locate the figures in landscapes that reveal the influence of Joachim Patinir. 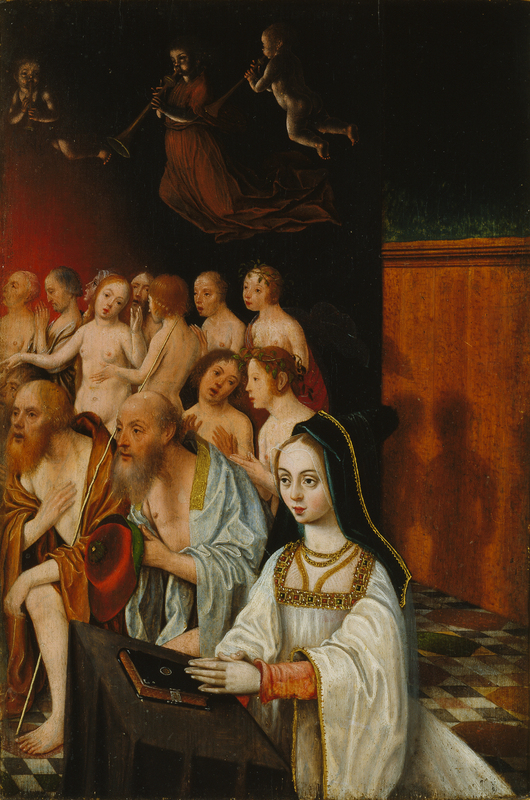 The present panel was the right wing of a diptych, of which the left wing is now in the Rijksmuseum Twenthe in Enschede. From the latter we know the subject of the whole work, which was Christ’s Descent into Limbo. In the painting in Enschede, Christ is located in the centre leaning towards the Virgin while on his left we see Adam and Eve with the souls of the Just in the background. The foreground of the present panel has a female figure in 15th-century dress in an attitude of prayer. She has been identified as Mary of Burgundy, first wife of the Emperor Maximilian I and mother of Margaret of Austria, for whom Mostaert worked. The souls of the Just occupy the space behind this figure while above them we see various musical angels. Jan Mostaert was an artist of the Haarlem School, which was a particularly active centre in the early decades of the 16th century. Much remains unknown regarding his life, although he may have trained with a follower of Geertgen tot Sint Jans as his early works reflect the style of that painter, particularly the figures. Karel van Mander provided some details about his life that have been questioned by modern writers, such as the fact that he was in the service of Margaret of Austria, regent of the Low Countries, for eighteen years. It is, however, known that he worked for Margaret, painting replicas of portraits and religious works, a fact recorded in two documents of 1519 and 1521. Mostaert’s name, however, disappears from the records in Haarlem between 1516 and 1526. Mostaert possessed a delicate style and was a fine portraitist, qualities appreciated by Margaret of Austria to judge from her commissions from this painter. The artist is documented in Haarlem between 1527 and 1554, and in 1504, 1543 and 1544. He occupied official positions in the painters’ guild of that city. The present panel is the right wing of a diptych whose left wing is in the Rijksmuseum Twenthe in Enschede. That painting, which depicts Christ’s Descent into Limbo, enables the present subject to be identified. The Enschede painting depicts Christ in the centre leaning towards the kneeling Virgin, his gesture inviting her to rise to her feet. To Christ’s right are Adam and Eve while the background includes standing figures of the souls of the Just, including King David with his harp and crown. The figure of Saint Michael holding the triumphant Christ’s banner acts as the connecting link between the foreground and background. In the present panel the artist depicted an interior with lines of figures of the Just. The foreground has a richly dressed figure of a praying donor who witnesses the supernatural events. Dressed in the Burgundian style of the last quarter of the 15th century with a striking headdress, she has been tentatively identified as Mary of Burgundy, mother of Margaret of Austria. It has also been suggested that this figure was added to the composition at a later date and by a different artist, a suggestion rejected by Colin Eisler. The subject depicted here falls within the cycle of the Glorification of Christ and takes place before the Resurrection. Christ descended into Limbo to liberate the souls of the un-baptised Just and to lead them to Heaven. These souls included the Patriarchs of the Old Testament. The subject was popularised through the Apocryphal Gospel of Nicodemus, the Speculum Humanae Salvationis by Vicente de Beauvais, and the Golden Legend by Jacopo da Voragine, although it has been suggested that the present example is more directly linked to the Égloga de la Resurección [Eclogue of the Resurrection], a Spanish religious drama that may have been known to Margaret of Austria.